“Soshun” Kabusecha tea (jap. “Soshun” = “erly spring”) is Japanese half-shaded green tea picked atthe beginning of the early harvest season (middle of April), coming from the prefecture of Kagoshima in the south of Japan. The early picking character, several weeks of shading with “Kabuse nets” before the harvest and a high leaf grade guarantee for a top class Kabusecha tea (also: “Kabuse Sencha” tea). Kabusecha tea (also: “Kabuse Sencha”) is a typical Japanese (half-shaded) tea, characterized through the half-shading of the tea gardens by means of so-called “Kabuse” nets during the days/weeks before the harvest. Our Kabusecha “Soshun” (jap. “Soshun” = “early spring”) is a half-shaded Sencha tea (also: “Kabuse Sencha”) picked at the beginning of the early picking season (middle of April) coming from the region around Kagoshima, capital city of the prefecture with the same name located on the island Kyushu on the most southern tip of Japan. While due to the vicinity of the tea gardens to the still active volcano “Sakurajima” our Kabusecha Soshun crops in particularly rich soils, the mild sun of the early spring and the sooting climate of the the southern Kagoshima region, which is like tailor-made to tea cultivation, promote especially the young tea plants’ enrichment with taste, aroma and other active substances and give the Kabusecha tea from this early harvest their characteristic high yield and the unique intensive fragrance. To further increase the quality of the tea, the tea bushes are cultivated under Kabuse nets (jap: net = kabuse) during the last (up to 3) weeks before the harvest. Unlike Gyokuro Tea, for which the tea plants are shaded for several weeks before the harvest, the Kabusecha shading method (up to 3 weeks of shading for our Kabusecha Tenko) comprises a half-shading, with ca. 50% of the sunlight being filtered out (compared to ca. 90% for Gyokuro). 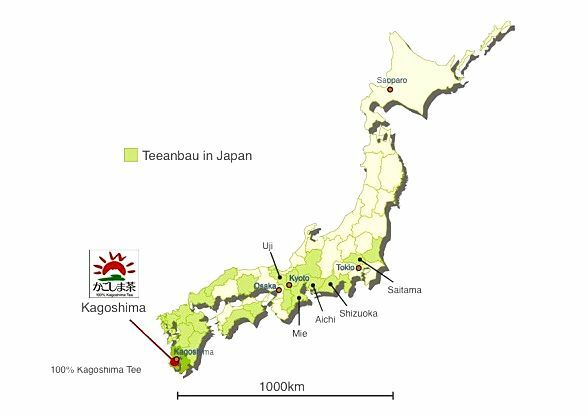 Therefore, Kabusecha tea is also commonly referred to as half-shaded tea. The idea behind the Kabusecha method is that of the recreation of natural conditions, i. e. a part-shading of the tea bushes as it would take place through trees and larger bushes in natural environments. The ca. 50% withdrawal of light during this period triggers activities in the tea plant that are leading to an altered composition of the ingredients with increased amounts of amino acids (e.g. Theanine) and alkaloids (e.g. Caffeine, Theophyllin) and a reduction of bitterns (e.g. Catechine), among others resulting in a higher sweetness of the tea. Also the aromatic fragrance and the deep green color of the tea are enhanced through the shading. Aroma- and tastewise, Kabusecha Soshun convinces with the best of two worlds, the world of light and the world of shadow. : a rich, fruity fresh aroma of the highly clear, jade-green cup and a distinctive taste characterized by sweet and nutty flavors that will please the palate long beyond the actual drinking experience. Excellently balanced taste profile, with hay notes becoming more dominant in later infusions. Very well-balanced flavor pattern, in which the hay notes become increasingly dominant with progressing infusions. Due to a slightly higher temperature applied to this teas’s drying procedure, it evaporates a particularly rich, multi-facetted and sweet fragrance, along with a velvety harmonious taste. Much ‘umami’ sweetness in the first steep, even more in a second, altogether even more velvety infusion, followed by a roller-coaster of flavors across ensuing steeps, different types of vegetables “in a hay bed”. Preparation: Dose Kabusecha Soshun tea leaves into the teapot, pour over with water tempered according to below recommendation, let infuse and pour out into previously prepared drinking or tea cups. Water: For the preparation of our Kabusecha tea, we recommend using as soft as possible (low lime) water of a temperature of ca. 65°C. Teapot: Best suitable for the preparation of Japanese Sencha tea and Kabusecha tea are clay teapots (alternatively Japanese Kyusu or Chinese style teapot), but you will achieve comparably desirable results using a China bone or a glass teapot. Infusion period: with an infusion period of ca. 2 minutes for a first infusion and considerably shortened (ca. 1 minute) follow-up steeps, this Kabusecha tea will produce a range of delicious infusions with varying taste and aroma profiles. With weaking taste after several infusions, we recommend to let a last infusion infuse for an extended period again (2 minutes). Tea cups: In Japan, Kabusecha tea is enjoyed in smaller to medium-sized teacups (“Chawan” or “Yunomi”), whose style and prefered size can be adapted to actual requirements, i.e. situation and mood.